But how much more each school district will get is still being calculated by the Department of Education. 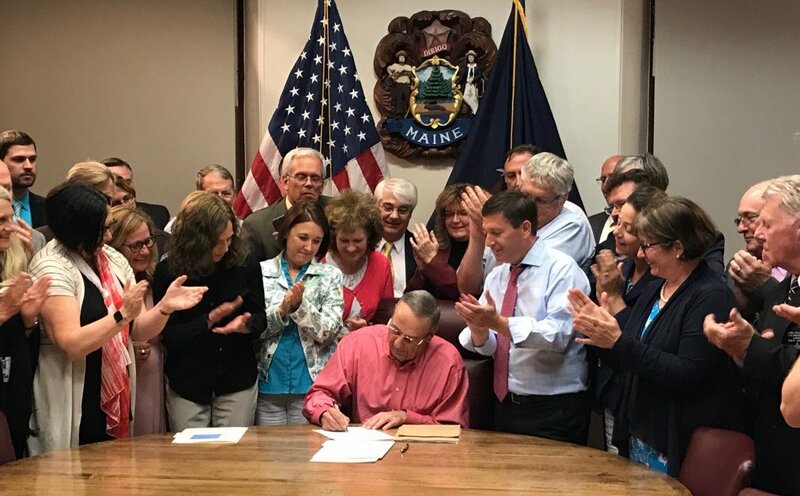 AUGUSTA — Maine’s 240 public school systems will soon learn how they will share $162 million in new educational funding in the two-year state budget signed by Gov. Paul LePage early Tuesday. The budget, which resolved a partisan stalemate and ended a three-day government shutdown, will provide an additional $48.4 million to school systems in 2018 and another $113.6 million in 2019. But how much districts receive depends on whether they choose to collaborate with other districts. The budget also aims to send more funding to poorer districts and allow districts to tap a fund for unexpected special education costs that arise during a budget cycle. As part of an agreement to provide the $162 million for schools, lawmakers eliminated a 3 percent tax surcharge on high-income households that voters approved in November. The surcharge was designed to increase state funding to 55 percent of the costs of education, a level also mandated by voters in 2004, but which the Legislature has never approved. Rep. Brian Hubbell, D-Bar Harbor, a former member of the Legislature’s Education Committee who now serves on the Appropriations Committee, said district-by-district funding was still being calculated by the Maine Department of Education. State allocations to school districts are based on a complex formula that considers several factors, including the value of a district’s property tax base, the percent of low-income students it serves and the district’s special education costs. LePage, who has long argued that Maine districts employ too many administrators, warned that there would be, “hell to pay in education” in the coming year, apparently because of the additional funding. He made the comment soon after he signed the new $7.1 billion state budget ending the shutdown, but he didn’t elaborate on what he meant and a request for clarification Wednesday to his staff was not answered. Hubbell said in an email that the new budget partially rejected a proposal from LePage to cut funding for school administration, a move that would have pushed $40 million in annual costs to local taxpayers. The final budget also did not include a pilot program for a statewide teachers contract, which LePage had sought. Hubbell also noted that the new budget will designate $27.5 million for schools with larger numbers of “economically disadvantaged” students. House Speaker Sara Gideon, D-Freeport, said Wednesday she couldn’t speculate on what LePage meant when he said there would be “hell to pay” in education. “I never try to guess what the governor is thinking or has planned,” Gideon said in an appearance on Maine Calling, a talk show on Maine Public. Lois Kilby-Chesley, president of the Maine Education Association, a statewide teachers’ union, said LePage’s words were threatening to students and teachers alike. With the budget in place, the Legislature will now consider any bills that require voter-approved borrowing or bonds, as well as bills that call for studies of various issues or topics. Lawmakers will also have to decide which of the more than 200 approved bills that require new state spending will receive it. Senate President Mike Thibodeau, R-Winterport, said few of these bills will receive funding because the new budget used most of the state’s surplus, usually the source of any new spending. “We closed a $7.13 billion budget with essentially $7 million sitting on the sidelines; that is razor thin,” Thibodeau said. When it does finish its work for 2017, the Legislature will recess for another 10 days to give LePage time to veto or sign bills still on his desk. Lawmakers will then reconvene for a veto override day. That will likely push the final day of the legislative session close to the end of July.